The course gave me more ideas for using social media and as a result I will create a bigger presence on my company’s social media networks. I have learned a lot about digital marketing which is very useful for the summer internship I have just started. It was very interactive and many sources were used, including YouTube, which made it very interesting. 10/10. The course was relaxed, friendly, informative, organised and with great material to take away. The most important thing I learned was understanding all the different marketing tools and solutions that I can now access to increase brand awareness. It was brilliant to build my marketing plan during the workshop, so I went away with a focus. 10/10. “Many thanks for yesterday – I thought you pulled off the nearly impossible; the right balance between trying to cover every potential aspect of marketing activity, in just one day, without completely confusing everything by including too much detail. I reckon we got exactly what we wanted out of this; a bang up to date basic understanding of all the marketing tools at our disposal so we can start putting together the fundamentals of a solid marketing programme that we can build on and develop over time in a structured way. Also, just looked through the USB key provided and am a bit stunned by the amount and depth of background and reference material supplied – these files will become our starting reference manual and are going to get some use I know. The most important thing I learned from the course was how I now take forward what I’m already doing and prove its worth. I enjoyed the course and it will help me to take a fresh look at our marketing, in particular our use of social media. 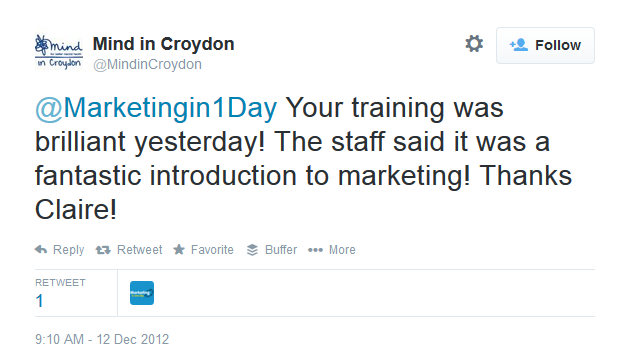 Marketing is broad and this course opened my eyes up to lots of new opportunities. I enjoyed Claire’s vast knowledge and real life examples. I have a better understanding of what marketing is and how it dovetails with PR. Thanks for a packed, informative and interesting day in which you covered so much ground. I will pretty much do everything differently as a result of this workshop – particularly in the social media world. The course allowed me to focus my aims more clearly, which should have a great impact on sales. I’m also really pleased with the SEO techniques I learned and will put those into practice ASAP! The most valuable thing was learning how to build my marketing strategy and about social media. Very good handouts and material for use after the training session. [The group size] seems to work well because it allows for people to ask questions specific to their company. For more opinions on Claire’s marketing skills and abilities, please see these testimonials. Is a Member of The Chartered Institute of Marketing.